Sensor networks enable the acquisition of diverse data, like air temperature, precipitation or fine dust. This information is an integral element of spatial analysis in domains like environmental monitoring, health care or safety. 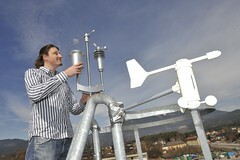 The project Sensors4All aims for the implementation of a small-scale sensor network in Villach, to collect representative, meteorological environmental information. An important criterion for further usage of this environmental information is data quality, fairly affected by measurement errors (i.e. wrong calibration or malfunction of sensors). In cooperation, scientists from Carinthian University of Applied Science, Department of Geoinformation and pupils as well as teachers from BG/BRG Villach St.Martin, at first plan and implemented the small-scale sensor network. In a second step, (spatial) evaluation and correction of the environmental information collected follows. Beneath simple methods, like limit checks, we would focus on spatial methods (comparison to neighboring sensors, interpolation of expected values and so on). These methods would be integrated in the Sensors4All Service Framework that was composed of Web-based services introduced through the Sensor Web Enablement (SWE) Initiative of the Open Geospatial Consortium (OGC). Through this approach we ensured the broad application of the expected results, aside proprietary systems that was currently in use. Finally, the evaluation of our developed components and general results takes place through processing the micro-climatic data in a micro-climate atlas. This micro-climate atlas focused on the pupils’ geographic surrounding and exposed them to the usage of meteorological parameters.